Fast, secure, easy way to get to your stuff. Go from your desktop to any NoMachine-enabled computer at the speed of light. Thanks to our NX technology, NoMachine is the fastest and highest quality remote desktop you have ever tried. Get to any computer in the world in just a few clicks! Take what's important where you go and share with who you want! NoMachine is your own personal server, private and secure. Did we say NoMachine is free? No strings attached. Don't feel limited. Enjoy live audio and video from your remote PC. Watch DVDs, the TV, Hulu or YouTube videos from wherever you are. Or render your animated models. Whether you are an artist or an engineer, your favorite software is always with you. When speaking about NoMachine many think Linux. This is because NoMachine’s first product, in 2003, revolutionized Linux and the X-Windows system, the standard remote computing system of the Unix world. 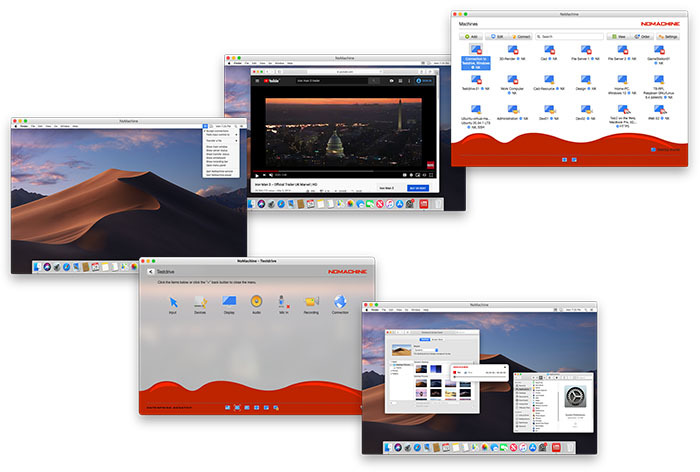 Since then NoMachine has developed its technology to cover all the leading server, desktop and mobile operating systems, so much it now runs on Windows, Mac, Linux, iOS, Android and Raspberry with the same incredible ease and performance. When remote desktop gets serious, you need a serious tool to do the job. NoMachine satisfies any enterprise remote access scenario and scales to fit your unique IT delivery needs. Be in control of your own data, hosted desktops, corporate computers and applications, where they're kept and how they're accessed. Secure, private and convenient. Learn how NoMachine's NX technology can power your remote desktop strategy. The program is wrapped in a well-organized interface with a pleasant look that shows each step you need to take to connect to a remote PC. I am a long time with you guys, before you were on Android. I have NoMachine on all my devices in my network. Do not stop doing this software EVER !!! You rule! NoMachine is a powerful and extensive remote desktop program that comes packed with features and is easy to learn and use. On a real broadband connection crossing firewalls, traveling through the net, the connection feels like I'm on a Remote Desktop on my own LAN, very fast. A big thanks for an amazing product that 'just works' across so many platforms! This application works as intended! Better than TeamViewer! I would like to let you know I love NoMachine. I'm a home user and NoMachine is an amazing remote access technology to access my home computer from college. NoMachine rocks! Already love the Windows version, now I reach my PCs from my tablet - love that too. I stumbled across a great piece of software for remote desktop. #NoMachine, I can't believe I've not found it before. Great stuff! Mightily impressed with your current packages and installation. Connecting was so painless. Many thanks for a great product! I simply can't live without it. It's the life-line to my job and gives great flexibility. I'm very pleased with NoMachine's robustness and responsiveness. I can now use my remote machine and actually forget that it's not directly connected to my monitor. This is the best in class remote desktop software. Was using your tablet version on my phone and it was fine. Now with small display support it's even better. Thank you! The latest release of NoMachine is outstanding and my goto favorite at the moment. ...NoMachine uses NX technology to provide you with encrypted security and, with regards to Linux, without the lag of trying to forward X through SSH. It's fast, pleasant to use and I think most people who try it will fall in love with it. Thanks very much, just wanted to say that..... I think the product is fantastic. I am often on unreliable connections from here in India and your tech ensures things run far smoother than Apple Remote Desktop.. If someone were to ask me what the most-polished tool in the marketplace at present is, I would have to say NoMachine. Don't think the competition is this slick, or spending the effort to develop such a quality product. I started to look into remote desktop solutions but none of them were any good. Then I found this wonderful app. .....Jaw dropping app, keep up the good work fellas, this is future tech right here. Highly, highly recommended!! We needed powerful 3D acceleration for molecular visualization. NoMachine's integration with VirtualGL was the only option that gave our users the performance they needed while simplifying IT work. NoMachine has become central to my efforts at training students in elements of computational biology. NoMachine has made it possible to provide the Linux environment to dozens of students, over the years, using one machine. As several of the tools I use for my work are developed within the Linux environment, this is a valuable service. Support is prompt, helpful and courteous. Above all, the software is reliable. One of my favorites was showing up to an new job with some sizable demands &, after some brief inquiry, finding they had a set of 128gb many core servers with NoMachine ready to go. Hello working from beach on ultra portables. NX has helped our Computational Science and Geophysics teams move away from expensive local workstations. We are able to leverage and share more powerful and accessible machines inside the datacenter for HPC access, remote desktop and visualization. The multi-client support, dynamic screen and bandwidth controls are superb, yet simple to use.